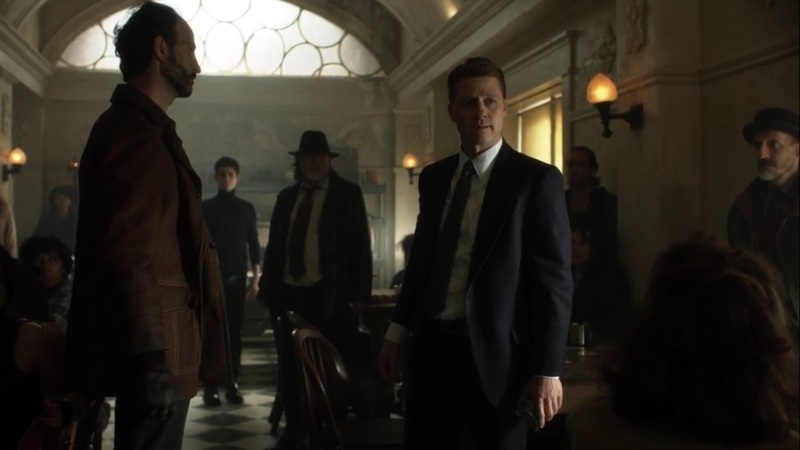 A Look at Gotham- Season 5, Episode 3: “Legend of the Dark Knight: Penguin, Our Hero” | What Else is on Now? Penguin is great. Oh, Penguin is great. Also, anyone fancy a trip to see Jeremiah? The episode begins with Penguin arriving to the sound of his own personal choir. 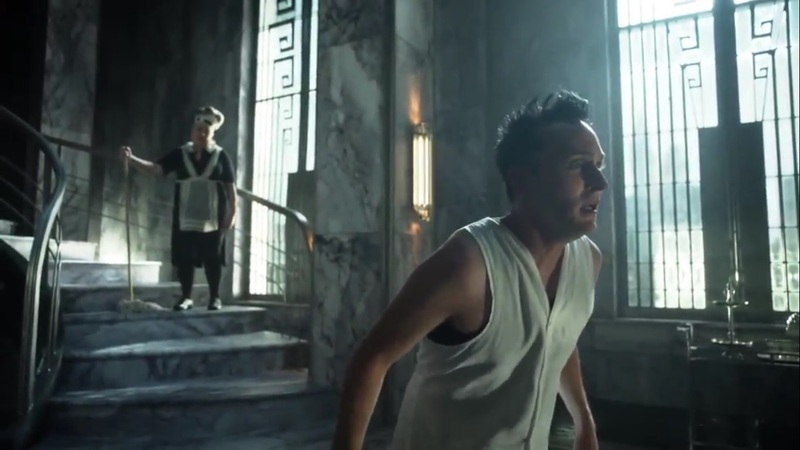 As he descends the stairs, he feeds Ed while Mr. Penn tells Oswald that production is steady. There’s more food and water in the territory, but one of the singers still passes out. Why? Because the workers were working throughout the night at the bullet factory. They’re short on hands since people have been defecting. Penn didn’t say this so Oswald wouldn’t be upset. 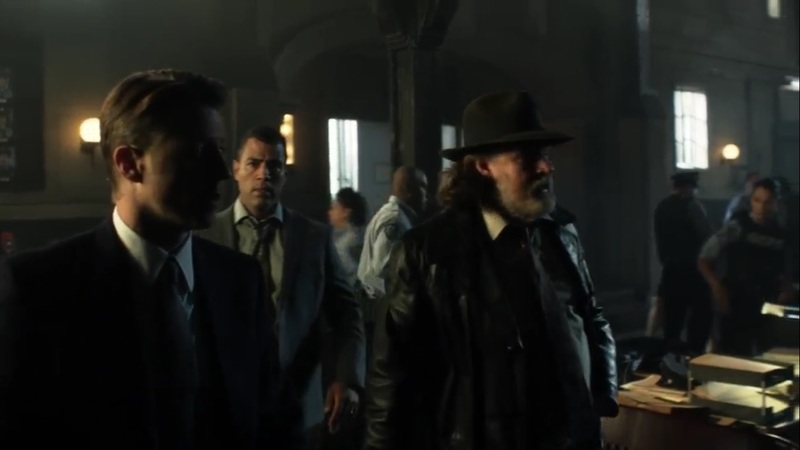 Rumor is that they fled to a place called “Haven” in Jim Gordon’s sector. 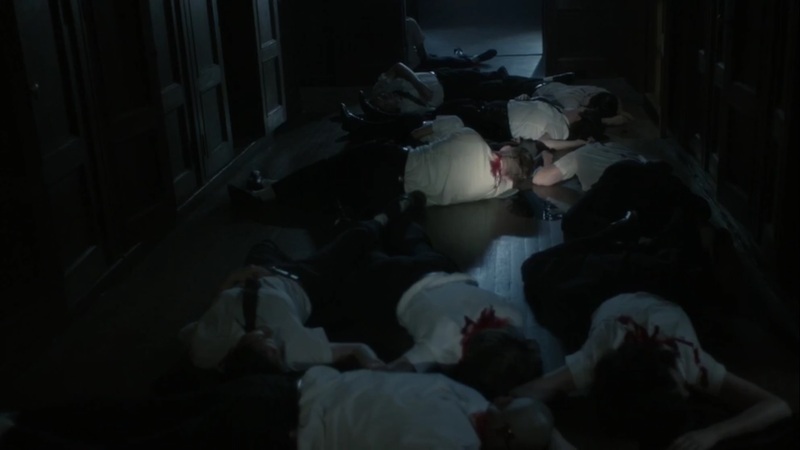 After Jim shot Oswald, in fact. 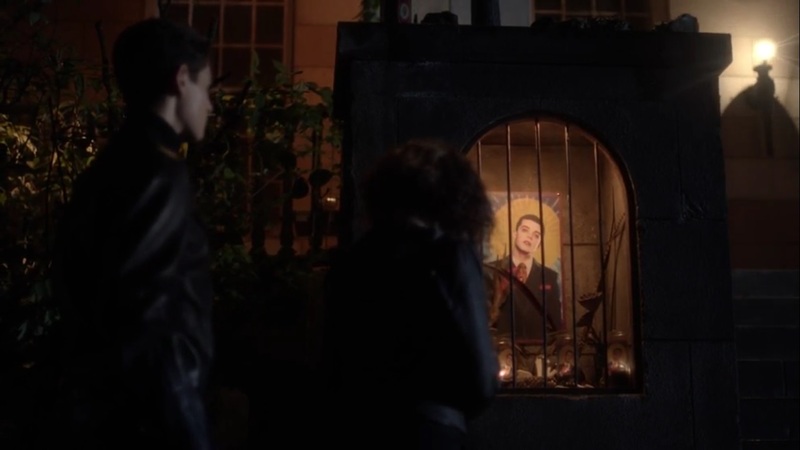 The fact is that the people love Jim, but Oswald wants the people to love him. But it’s not just Penguin’s territory. Everyone is fleeing to Haven. Just as breakfast arrives, some Street Demons storm the building in revenge for their men being killed, saying that he tagged the location with graffiti. 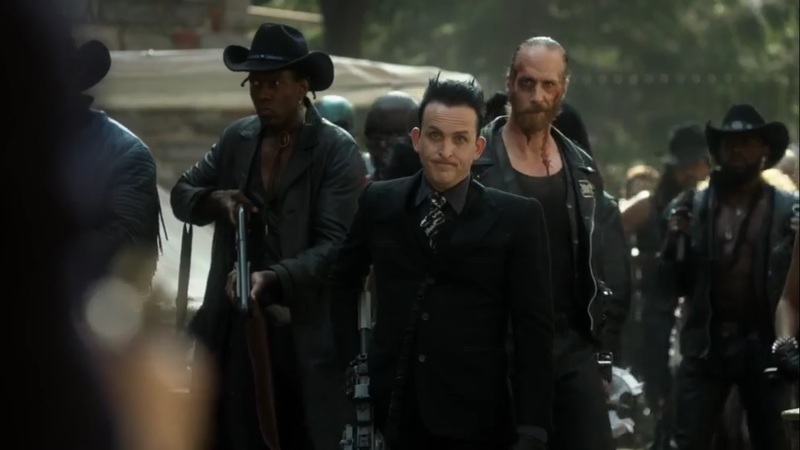 But if Oswald wanted to start a gang war, everyone would be dead. He wouldn’t leave some alive and sign his name. Someone wanted the Demons to attack him. Oswald is nothing if not smart. The Demons are taken away. He tells Penn to tighten the borders or it’ll be Penn’s head. 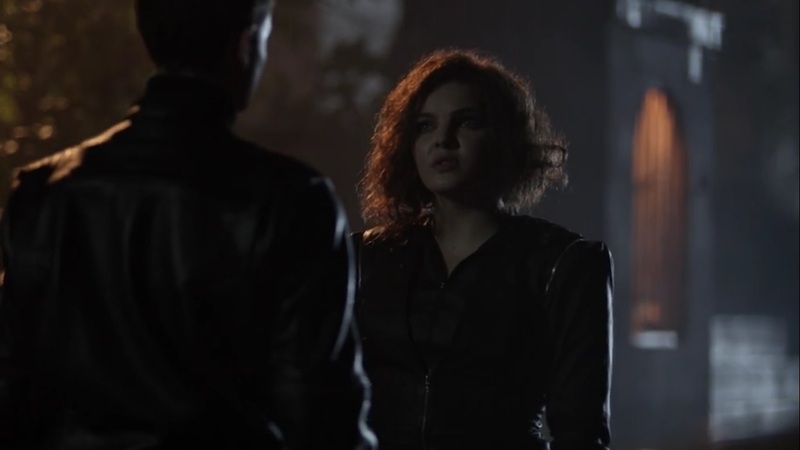 Selina is restless, as she’s having nightmares of being shot by Jeremiah over and over again. When she finally awakens, she heads to the rooftops in an all-black outfit and leaps from the top. 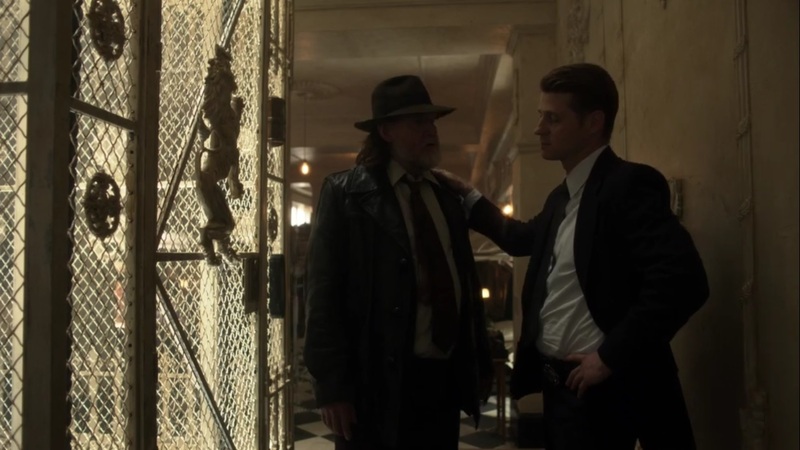 Over at Haven, Harvey tells Jim that word of the location has spread to the rest of Gotham. The gangs will want their people back and may come for Jim and Harvey as well. And after the last attack, they don’t have much ammunition or food. Harvey asks Jim if he’s getting any sleep, as he’s been carrying everyone’s weight for months. Harvey wants Jim to share the load. As Bruce updates the two on a new water purification system, a fight breaks out over some food. 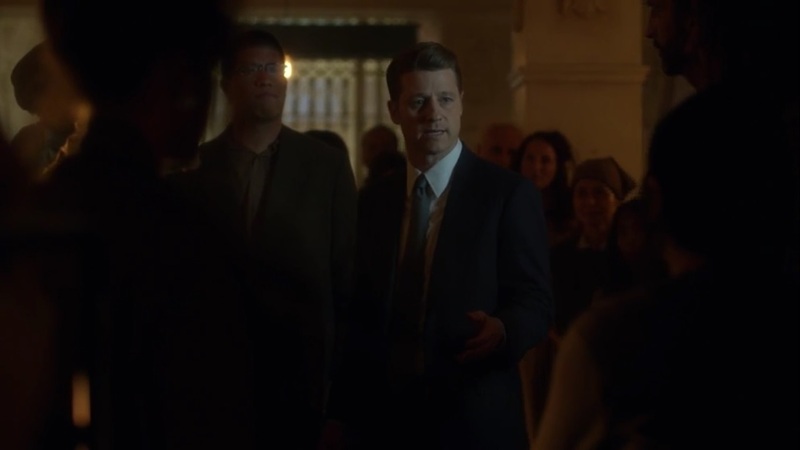 Jim takes this time to give a speech: everyone is welcome in Haven, but the fighting remains outside. They have to show the government outside Gotham City that they can survive. In Haven, everyone helps one another survive. Though Jim wonders to Bruce what will happen when they learn the government abandoned them. Bruce admires that Jim is giving people hope, but hope can only go so far. He then tells Jim that Will fell off of his bed from nightmares and broke his arm. He and Jim visit Will and inform him that he’s safe and no one else will ever hurt him. Jim then gives Will some rations of pineapple. Remember this, because it’ll kind of pay off later. Selina pops by and tells Bruce that Ivy’s seed has made her better than ever. Now she has to find Jeremiah. There haven’t been refugees in the Green Zone, she notices. The people have come from all over Gotham, so someone has to know something. Bruce knows that Jeremiah has had months to fortify himself. Selina tells Bruce that she can’t stop him from going to Jeremiah, but she still wants his help nonetheless. One citizen heard rumors about Jeremiah in the Dark Zone on the other end of the island. It’s chaos and ruled by those who lost their minds since the bridges were blown. They say that Jeremiah is there, gathering followers. The citizen warns them that they can’t go there. If they go to the Dark Zone, Jeremiah will be the least of their worries since everyone there is insane. To illustrate this, the man shows what happened to one of his friends, whose torso is littered with some very deep cuts all over his stomach. Penguin this time awakens to the sound of one singer- the maid. As it turns out that the staff has defected to Haven. The guards didn’t stop them…yup, they’ve gone to Haven, too. Even the dog, who apparently went willingly. Oswald then wakes up the Street Demons ember and tells him that their interests are now aligned. Oswald has bullets, the Street Demons have people. So it’s time to visit Haven. Side-note, the maid really deserves a raise or promotion just for sticking around. Harvey and Alvarez inform Jim that, based on reports from border guards, Penguin and Street Demons are headed for Haven. So Jim send Harvey to get some help. Bruce and Selina hit the streets and enter the eerily quiet Dark Zone. Bruce is happy that Selina is acting like herself again when Selina suddenly recognizes this as the posh part of town. The rich got out, but Bruce didn’t. He had a reason to stay. Then they find someone rushing towards them with a nail bomb strapped to him. As the bomb detonates, some Dark Zone members begin hacking at his body. They soon find themselves surrounded and tell them that they’re looking for Jeremiah. Okay, so time to fight. As Penguin’s group now sings at Haven, Jim orders everyone inside. But it’s too late, though, as the Street Demons arrive and start laying waste to the Haven. Jim tells the officers to hold their fire, and then do when Penguin rides in. 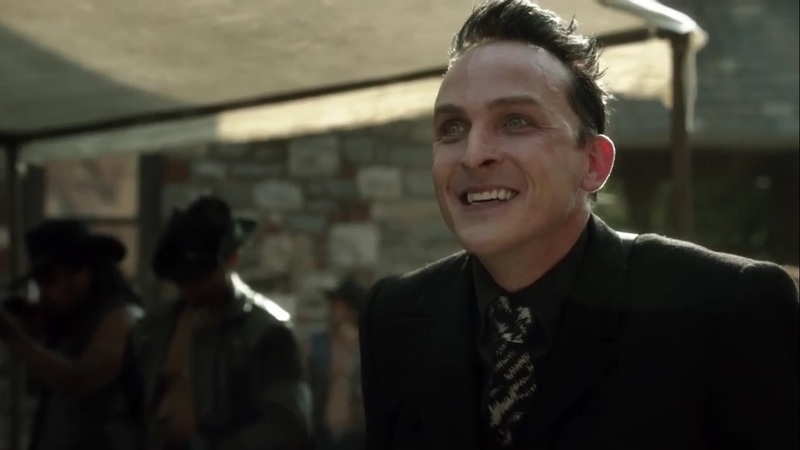 Oswald is elated to see his followers and wants them and his dog back. Jim tells them that everyone who arrived came of their own free will. Oswald wants his people, and dog, and an apology, or the Haven will be destroyed. Jim turns him down, and Penguin knows about Jim’s recent trip through the territories. As such, he bets that Jim used up his ammunition and is bluffing. 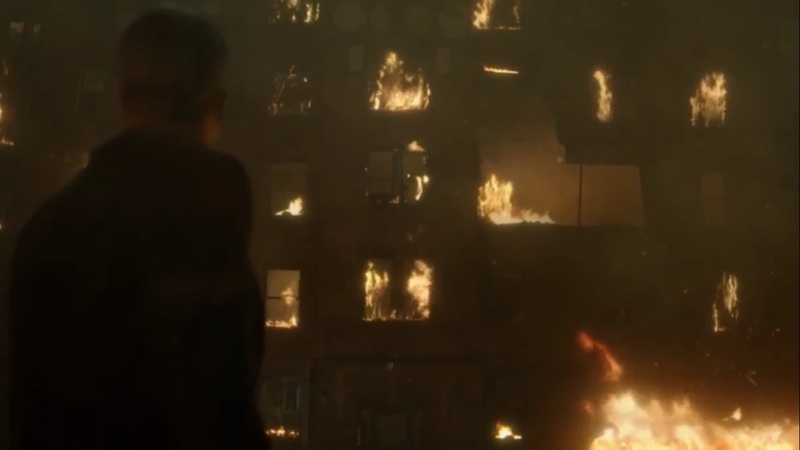 The GCPD does open fire to force the Street Demons back, but it’s clear that the officers really don’t have that much ammo. Bruce and Selina’s street fight continues, with Selina cutting at the big guy in order to find Jeremiah. He finally talks and admits that Jeremiah can be found up north, but Selina continues hacking at his face anyway. So Bruce uses a gatling hook to stop her. 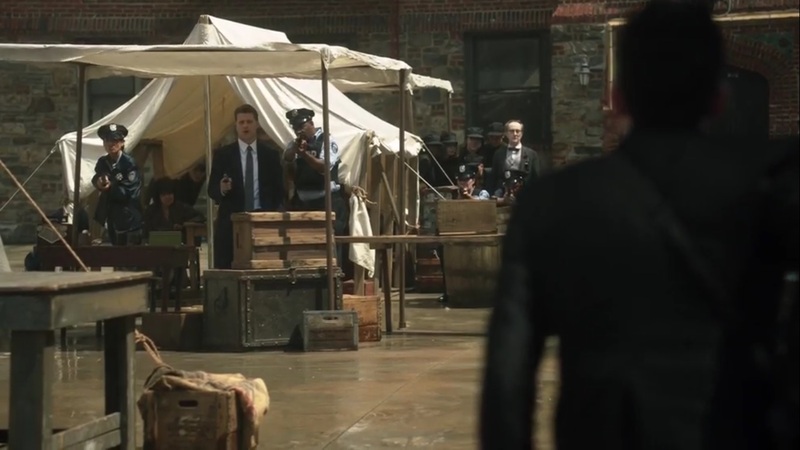 The standoff at Haven continues, with Oswald still believing that Jim is bluffing. He orders three Street Demons forward, knowing that he has ammunition too. The GCPD open fire and they do down one of the Street Demons, but they’re quickly out of ammo. Penguin marches forward and again demands his people. Before the Street Demons can open fire, Jim orders the GCPD to stand down. Bruce and Selina continue their trip through the Dark Zone, with Bruce telling Selina that he didn’t have to hurt that guy like that. But as far as Selina’s concerned, she did what had to be done. They arrive at the Church of Jeremiah, where a masked woman, Ecco, teaches her pilgrims about how to be their best self. Selina wants to go in closer, but Bruce holds her back. Ecco tells the followers that before they can see Jeremiah, they need a show of faith. Several followers volunteer, but Jeremiah apparently wants only the most faithful followers. They have a chance to prove themselves once they go upstairs. Everyone else can leave. Selina tells Ecco that she’s witnessed Jeremiah’s work firsthand and she’ll never forget it. And that is what gets her access up the stairs. However, Ecco whispers something to one of the men before removing her mask. 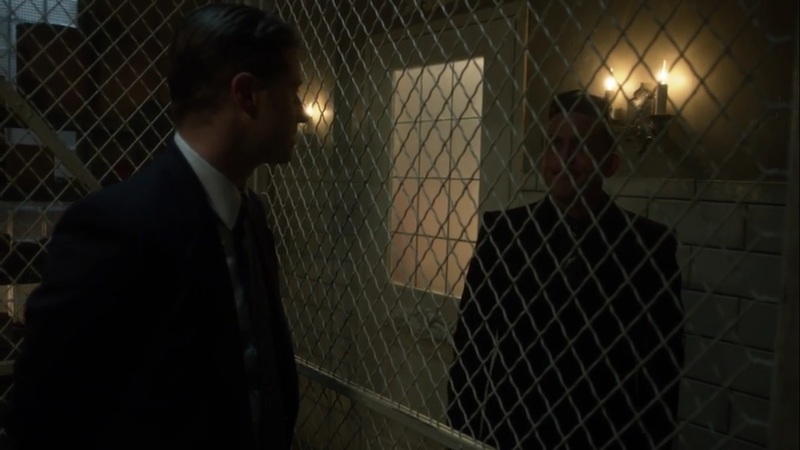 Over at Haven, Oswald has Jim put in a cell and promises to make him watch the Haven be destroyed. Oswald reminds Jim that the government has abandoned them. The only law in Gotham is power. 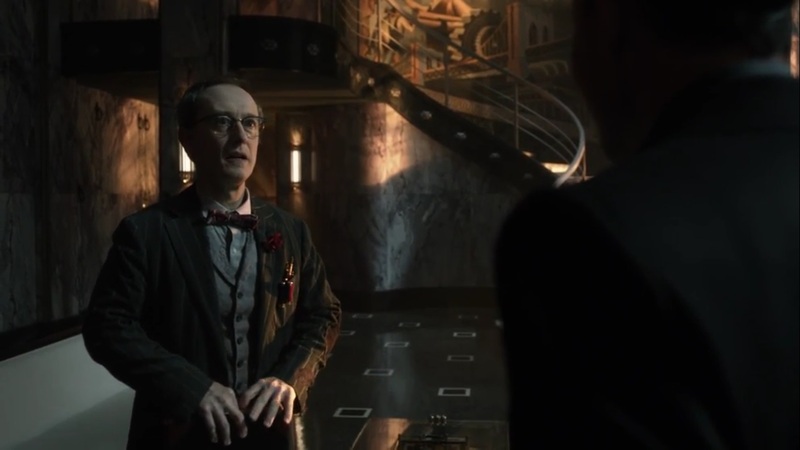 Jim wants to know what happens to the children and families, but Oswald figures that they’ll just go back to being slaves. Oswald’s people will go back to being full of food and praise for him. 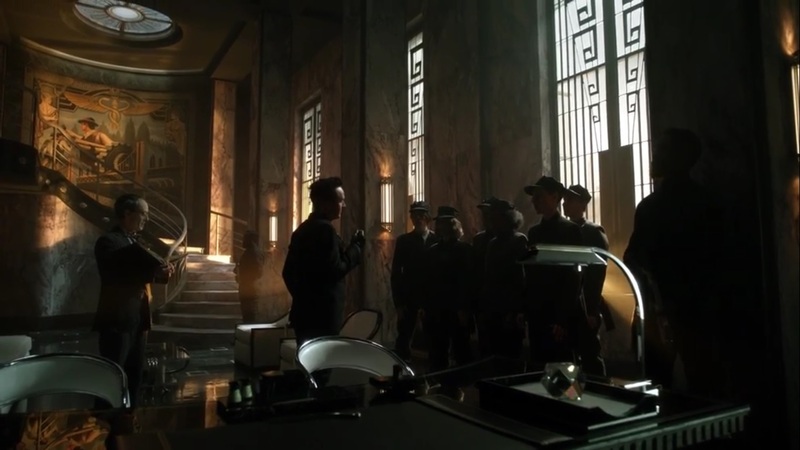 Jim wants the refugees left alone, and Oswald is almost tempted to do just that, but he’ll stick to his original plan of destroying Haven. 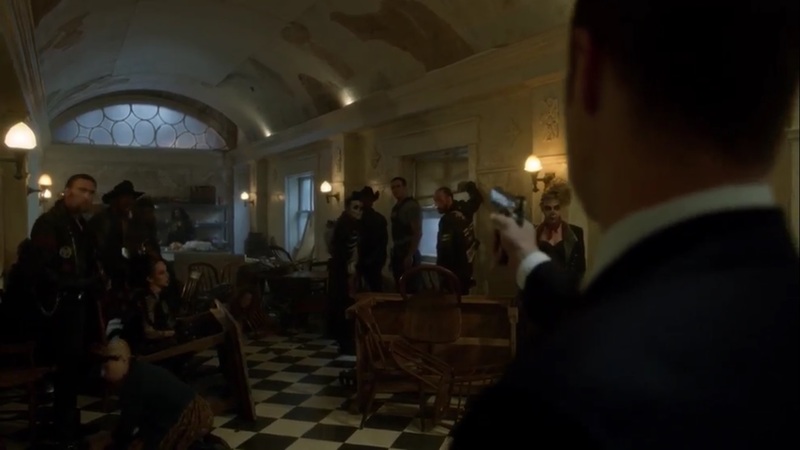 Back upstairs, Oswald wants Mr. Penn for himself. 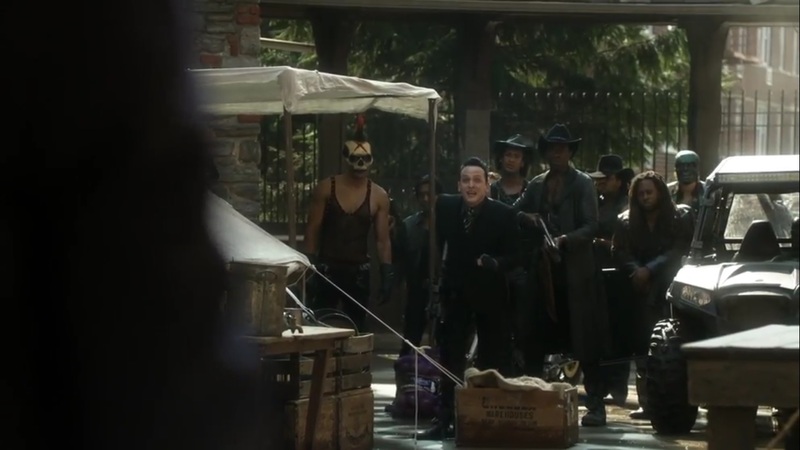 The Street Demons still want Penn in exchange for one of theirs being killed by the cops, but Oswald doesn’t care. Penn is his. but he’s still shot by one of the Street Demons anyway. They now opt to take Penguin’s territory and his bullet factory. Penguin lashes out at the dying Penn, saying that this wouldn’t have happened if he didn’t leave. So why did Penn leave? It turns out that everyone hated Oswald. 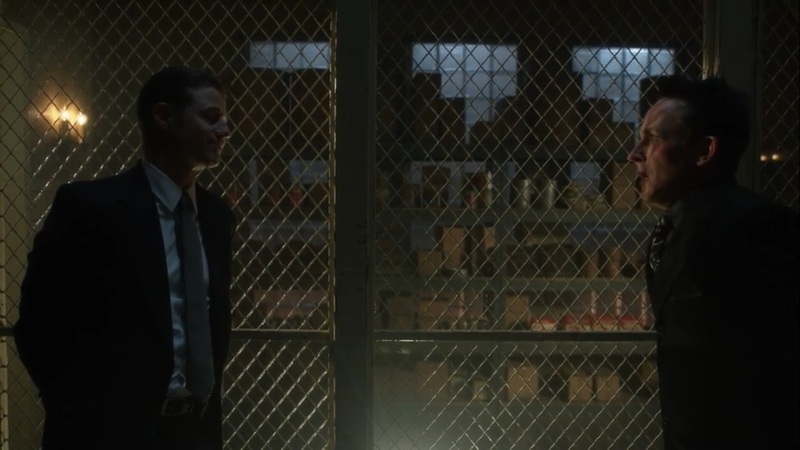 And just like that, Oswald is clubbed and put into the exact same cell as Jim. Funny how that worked out, isn’t it? Harvey heads to the Sirens’ Club to find Barbara and inform him that Jim needs his help. Though Harvey is held at knifepoint, Barbara remembers when Harvey and Jim first joined up, and Barbara was sane. She wonders what Harvey’s life would’ve been like had he not met Jim, but he figures that he would be dead. Barbara rails against the government saving them, but she finally joins in when Harvey mentions Penguin. Speaking of, Penguin refuses to help Jim, saying that the detective took everything away from him. He wants to know what makes Haven so special. In enters Will with two Street Demons. As they search for booze, Will slips a sharp object to Oswald and Jim. 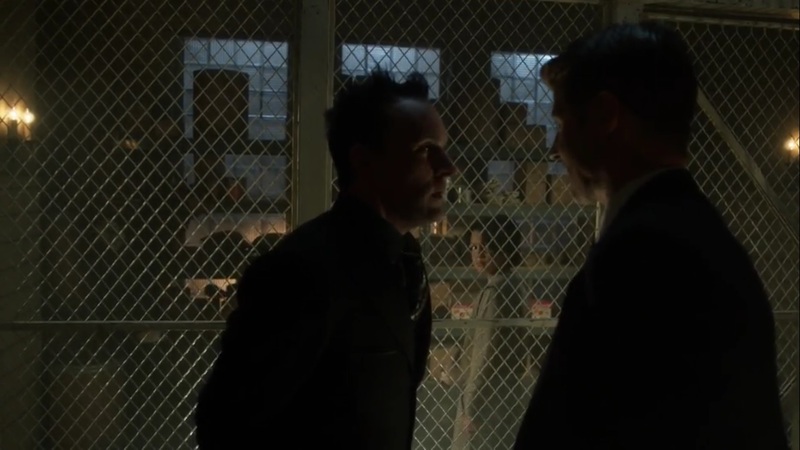 While Oswald still plans to destroy Haven, Jim tells him that they should work together to take out the Street Demons. But they still need to pick up the object. Back at the church, while Bruce finds a trail of bodies, Selina and the new recruits are led by Ecco to an arena for a test. They’re each given a gun with one bullet apiece. As Ecco leaves the arena, the recruits and Selina all point their guns at one another. As Ecco commands the pilgrims to fire, Bruce suddenly hears gunshots. While some of the pilgrims are dead, Ecco is disappointed in Selina in particular. Turns out that she placed her thumb between the hammer of the gun behind her so it wouldn’t fire. She tells Ecco that she’s not mindless enough to get shot in the head for nothing. Ecco tells the other pilgrims that this outsider is turning on Jeremiah. His methods may look like madness, but these methods will be their salvation. With that, Ecco tells the recruits to leave and be reborn. Ecco needs to have a chat with Selina in the meantime. As Bruce heads further up the church, Selina tells Ecco that she’s not trying to play her psychotic game, even though it’s so fun. Rather, she wants Ecco to play the game, but she already has. She’s already taken a bullet to the neck and it’s still in her skull. She feels it in particular on cold nights. Selina calls Ecco insane, but Ecco was willing to look death in the face to allow the old her to die. Ecco says this is a gift from Jeremiah’s brother and she wants Selina to experience this gift. She says this while addressing Selina by name. There isn’t a single part of Bruce Wayne’s life that they don’t know, after all, especially his desires. But Bruce wasn’t ready to embrace this life. 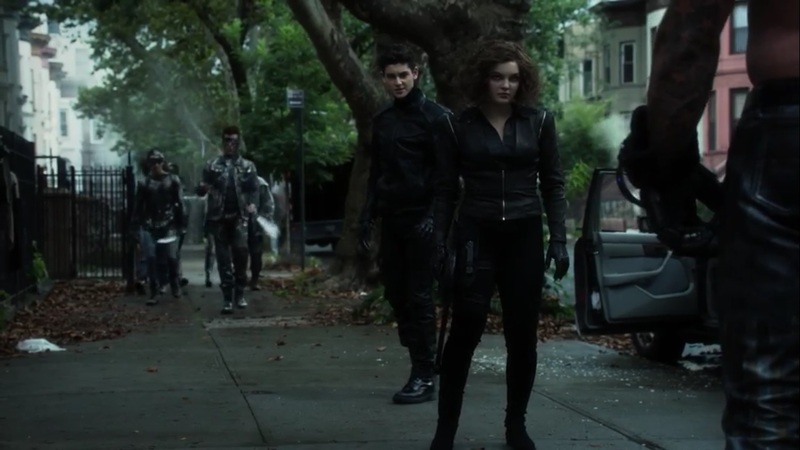 But Jeremiah did teach Selina that she hates having a gun pointed at her. She engages Ecco in a fight, but unlike the street thugs, Ecco is more than capable of holding her own. As Selina points the gun at Ecco, she practically commands her to pull the trigger. As Bruce enters and implores Selina to stop, Ecco gets the drop on Selina and stab her in the leg, giving her time to escape. 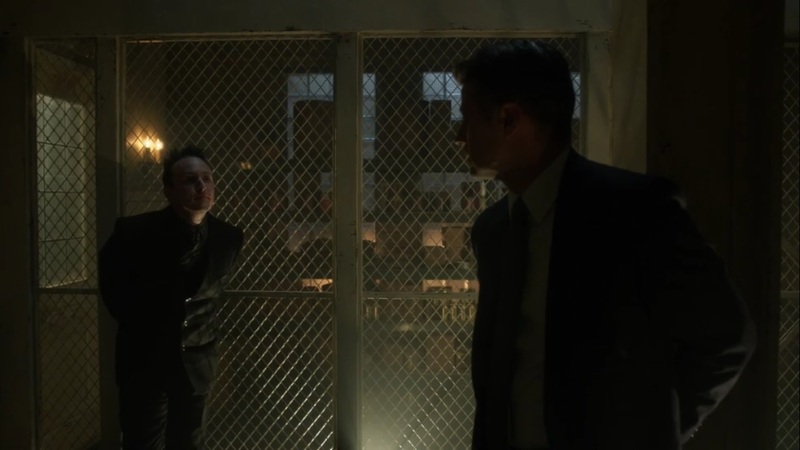 Selina cuffs Bruce to the bars and leaves, telling him that she’s done doing things his way. Though she’s bleeding and injured, she heads off. 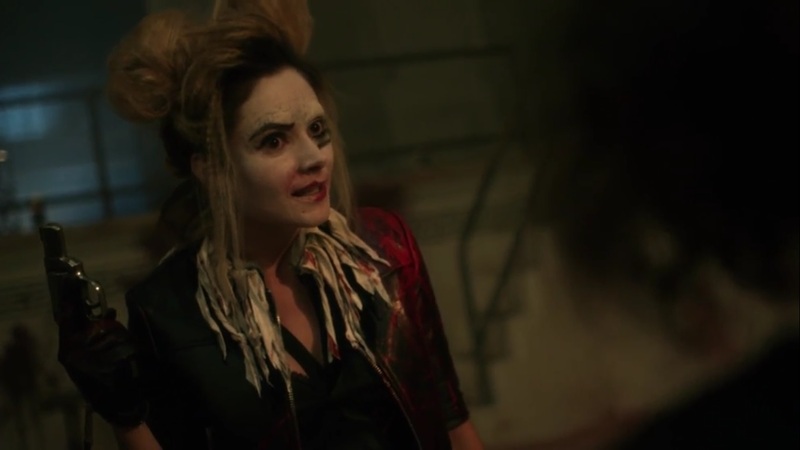 Oh, and Ecco calls Selina “Puddin.” I don’t think Mister J is gonna like that. That’s his name. Jim arrives and orders the Street Demons to put their guns down. 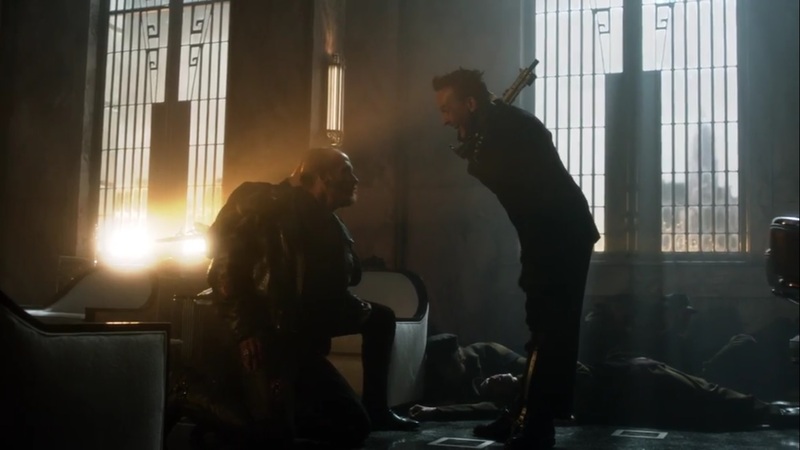 And he’s not alone, as he’s got Penguin and the GCPD backing him, with Oswald shooting down some of the Street Demons down. 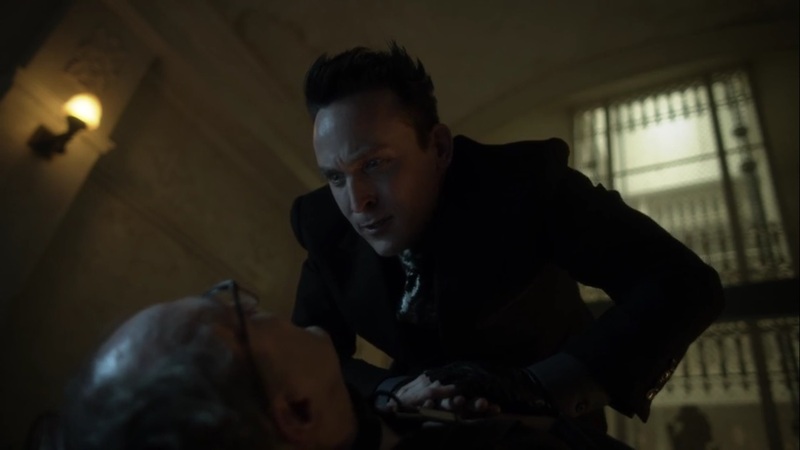 Only now does Ed come back to Oswald’s side. And the crowd starts chanting his name, so you know that won’t go to his ego, right? Later, the people are upset at Jim for what happened with the gangs entering Haven. Jim tells them that there will be hard days, but they won. They got Penguin’s guns and ammunition, but more than that, they survived. As long as they survive, hope survives. And Will agrees. Jim goes to him and thanks him for his brave effort. But hey, Jim saved him and his friends, so he wanted to help. Jim tells him that he’ll need people he can trust, so he entrusts Will as his deputy. It helps that Will is allergic to pineapple. Outside, Penguin hopes that there are no hard feelings between him and Jim, who tells him that he’s free to go. Harvey finally arrives with Barbara, who is ready to get her revenge. Jim reminds Barbara that outside of the Green Zone, Penguin is fair game, but not in Haven. And Jim refuses to move even though Barbara orders him out of the way. He won’t have to, though, as massive explosions rock the Haven and send it up in flames. Well, that was surprising. After last week’s journey to save the kids, we advance the plot further with Oswald taking his fight to Jim. 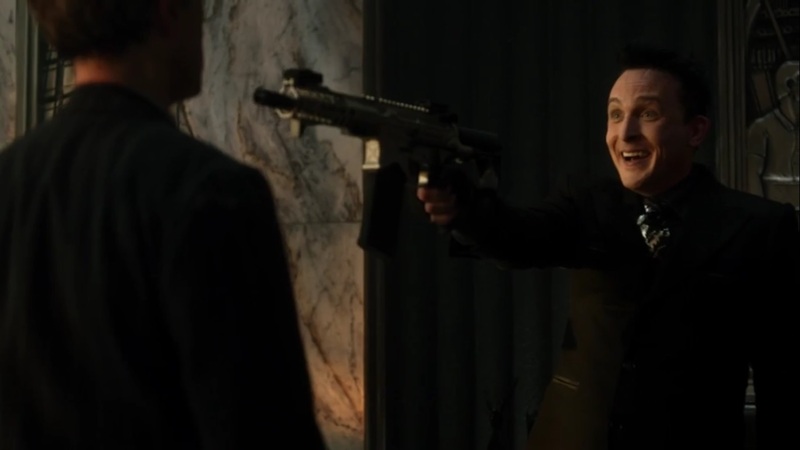 One thing I’ve enjoyed about Gotham’s take on the Penguin is that he usually won’t escalate a situation unless provoked. In this instance, we have Penguin’s staff defecting to Haven. More than that, he’s not very well liked. If there’s one thing Penguin wants, it’s to have people like him. He’s not ruling with an iron fist or enslaving people, but he’s not exactly the kindest of leaders, either. Given how easily he can fly off the handle, I buy that his staff would get fed up and leave. Especially if they find out there’s a safe Haven where everyone is welcome. Despite this, Penguin never gets in over his head. He remains as smart and cunning as he’s always been. Upon hearing about the supposed “attack” that he caused, he instantly figures out that someone staged it to get the Street Demons to come after him. Plus, he’s heard through the grapevine about Jim’s adventures and knows that he’s probably out of ammo. He wasn’t completely right, but his hunch proved to pay off when the officers quickly found themselves out of ammunition. Even with all of this in mind, Penguin isn’t doing this out of spite. He sees it as the natural order of things. Like he tells Jim, the government has abandoned them. So it’s every man, woman, and child for themselves. He probably wouldn’t make slaves out of families, but that’s what he knows other territories will do. At the end of the day, he still proves to be a useful ally to Jim. It was inevitable that the two would join forces. 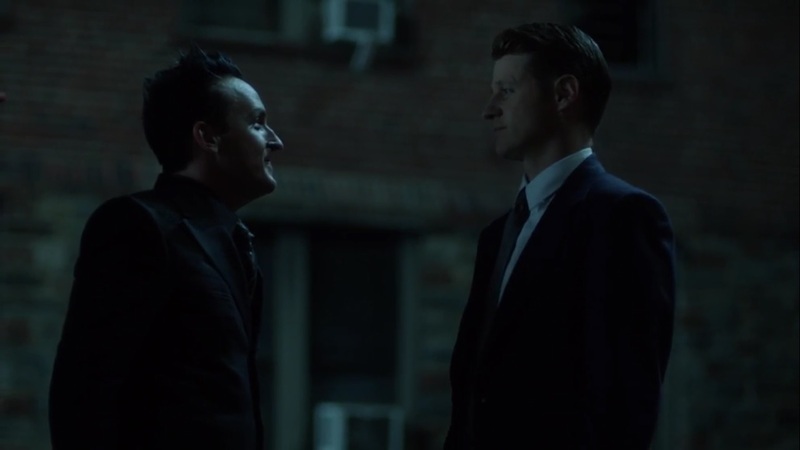 Since Jim’s first arrival, Oswald has been there as a key “friend” to him and the two working together provides for some great moments. That’s true here when the two get the drop on the Street Demons and Penguin wins the praises of the people. Sticking with Jim for a moment, I liked Harvey’s words to him about not bearing this burden by himself. Jim has a lot on his plate and it’s not getting any easier with people streaming into Haven. Yet Jim isn’t in this alone. Whether it’s Bruce or Harvey or Lucius or even Barbara, he’s got friends all around him. If his team-up with Penguin was any indication, he’ll never find himself short of help again. Well, Haven is up in flames, so it remains to be seen just how much help he has left. I’m curious to see who the culprit of this was. Could it have been Jeremiah? After all, he seems to be operating from the shadows. 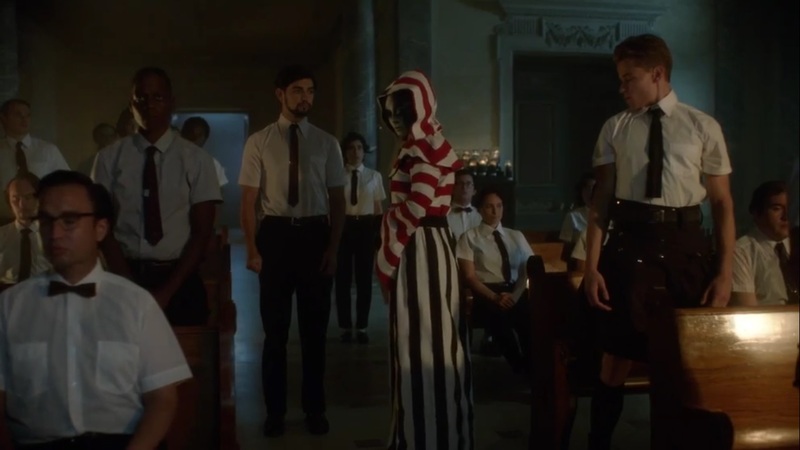 I have to applaud Gotham for its restraint here. 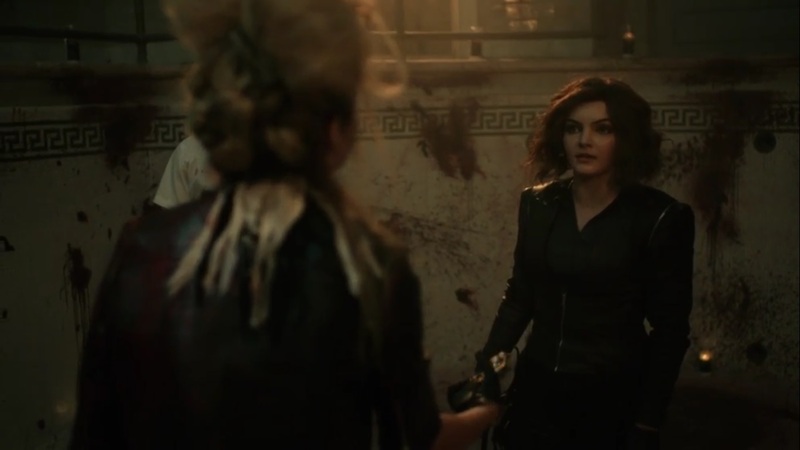 Even with Bruce and Selina going to the Dark Zone, I thought one of two things would happen: we either wouldn’t see Jeremiah or he’d be the very last thing we saw in the episode. To my surprise, the show went with the former. I like that. It ramps up anticipation for when he inevitably shows up. But that didn’t make the trip to the Dark Zone any less engaging. 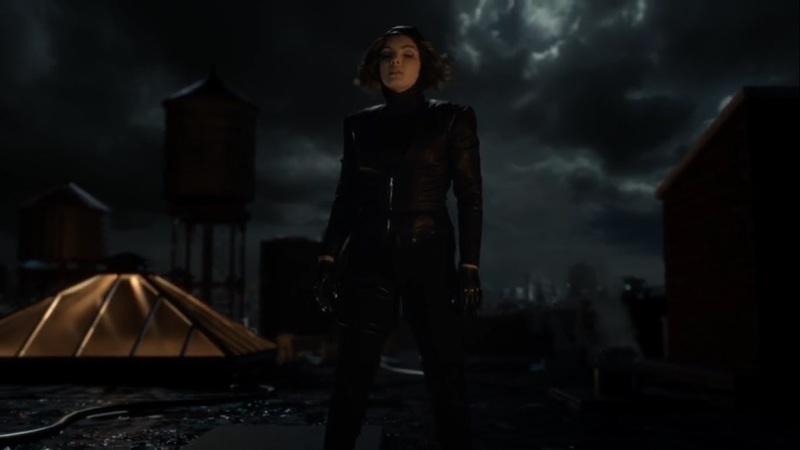 Selina going to a dark place shows how that seed did more than just repair her spine. Fundamentally, she’s still Selina, but more willing to use violence as long as she accomplishes her goal. Given what Jeremiah did to her and the pain it caused, it wouldn’t be too out of character for Selina to up the ante, so this makes sense. Bruce being Bruce, though, is trying to keep her on the verge of doing something she’ll regret. The problem is that Selina isn’t one to follow orders. Plus, Bruce isn’t one who would try to tell her what to do. It’s why he says that he’s on her side. He disagrees with her methods, but gets why she’s so committed to going after Jeremiah. The whole Church of Jeremiah sequence was very creepy and atmospheric. First off, Bruce finding that trail of dead bodies instantly gave me vibes of The Dark Knight Returns when Joker killed a bunch of children by giving them poisoned cotton candy. Clearly it takes a lot to become one of Jeremiah’s most loyal followers, especially at the cost of your own life. Ecco embodies that to a tee. While Francesca Root-Dodson has been serviceable in the role of Ecco so far, this felt like the moment for her to shine and damn did she do that. 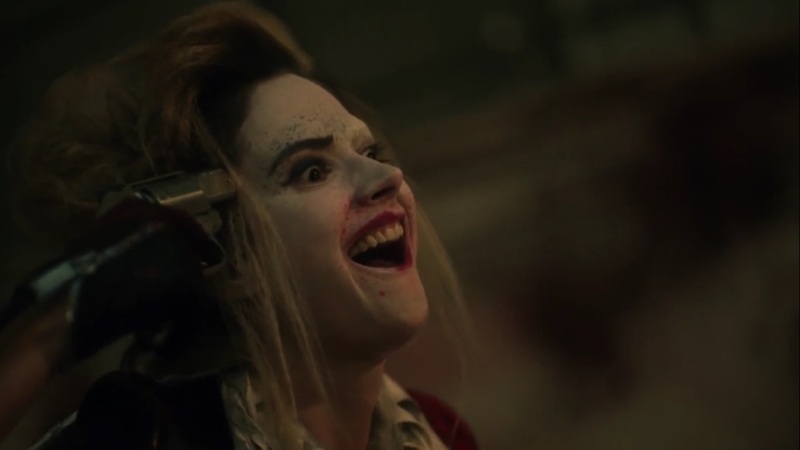 The bullet still in her head, her mannerisms, and her saying the word “Puddin” set her up as as a very demented proto-Harley Quinn. Now Bruce will probably find a way out of those cuffs, but he’ll have to hurry if he wants to stop Selina from getting into more danger. She’s already injured and out of her element, so she’s at a huge disadvantage. 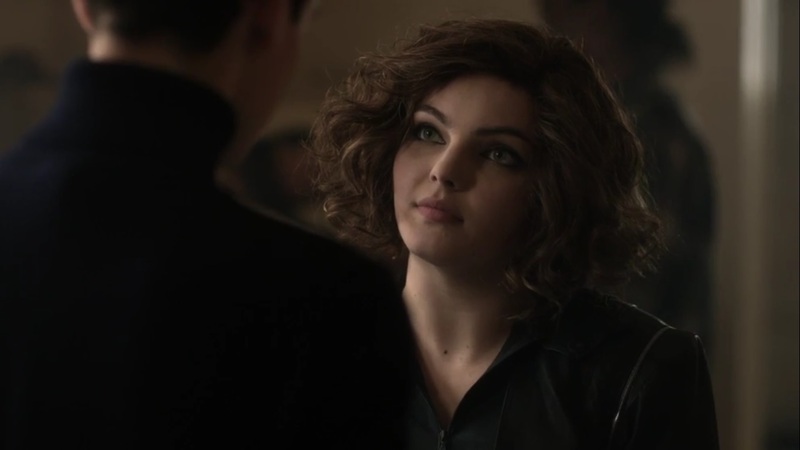 But this is Selina Kyle. She’ll find a way to survive. This was a very strong episode. Jim and Penguin teaming up is always fun to watch, but now they’ll probably have to join forces yet again to find out who blew up Haven. 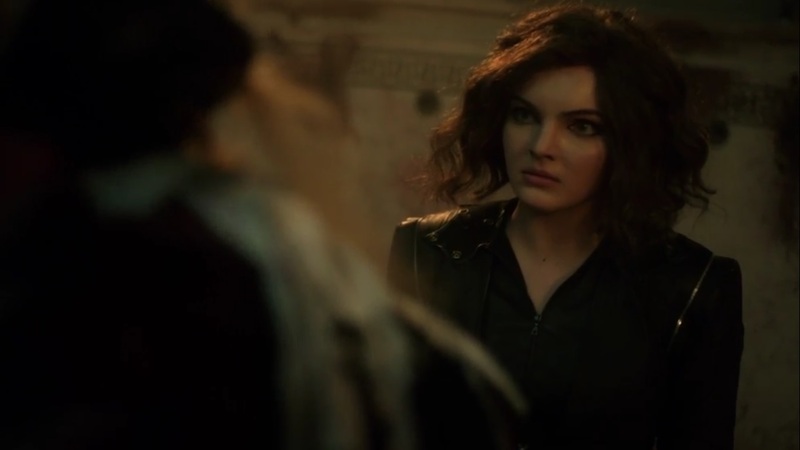 As for Bruce and Selina, when will they finally have their confrontation with Jeremiah? Who knows? See you next week. 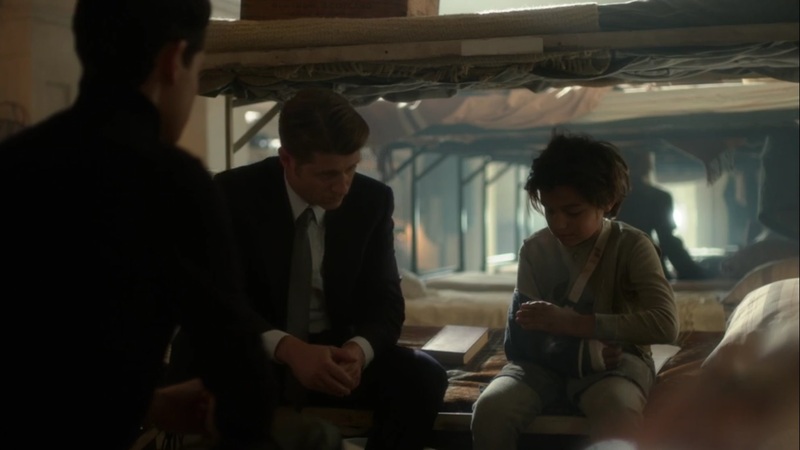 This entry was posted in Gotham and tagged Andrew Sellon, Barbara Kean, Ben McKenzie, Bruce Wayne, Camren Bicondova, David Mazouz, Detective Alvarez, Donal Logue, Erin Richards, Francesca Root-Dodson, Gotham, Harvey Bullock, J.W. Cortes, Jim Gordon, Mr. Penn, Oswald Cobblepot, Penguin, Robin Lord Taylor, Selina Kyle by omarid513. Bookmark the permalink.